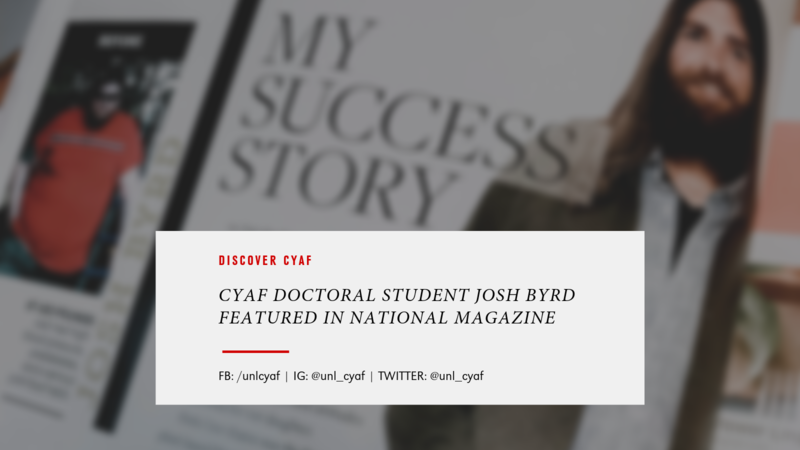 Josh Byrd is a doctoral student in the Child Development/Early Childhood Education program in the Department of Child, Youth and Family Studies (CYAF). He's a familiar face. He originally hails from eastern North Carolina and got his undergraduate degree from the University of Mount Olive and was drawn to Nebraska because of important work by key faculty members, such as Dr. Helen Raikes, Willa Cather Professor, and Dr. Julia Torquati, Interim Department Chair and Professor. Byrd attributes his progress as a doctoral student to the people around him, saying, "honestly, the friends I've made in our department are second to none." While at the University of Nebraska, Byrd has enjoyed traveling to India with CYAF and living abroad while conducting research for two months the most. This opportunity allowed him to tour parts of northern India and the Himalayan Mountains. But Byrd has also been on another journey, one that was highlighted in an article in the Fall 2018 edition of "Forks Over Knives" magazine. Byrd's inspirational story details his decision to live a healthier lifestyle and the major transformation that took place as a result. And it's this journey that has heavily influenced the research that he does and the future goals he has in place for his family. He is currently pursuing a doctoral degree and aiming for a tenure-track position, but also dreams of owning an organic market and café with his wife where they will serve affordable and healthy vegan meals. To read more of Byrd's incredible journey, pick up a copy of Forks Over Knives or stop in the CYAF office where there is a copy as well.